You can use gazebo wedding decorations, to lend that element of fascination and allure, to any type of a wedding, ranging from a beach wedding to a garden wedding in the backyard of your own house. The biggest advantage of this type of a wedding decoration is that you can transform even a plain construction into a spectacular structure by having it dressed up to camouflage any flaws. You can also conceal such defects by diverting the attention with theme wedding parties. 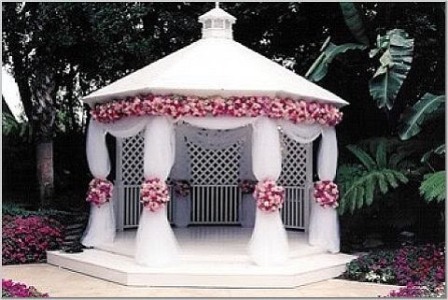 One economical and modest way of decorating gazebos include flowers. You can make entire long garlands of flowers and have them entwined about balustrades, beams, and columns. You can also have them swung from the roofs in complementary color combinations. You can try other affordable ideas for draping the pillars and bars. This can be done by using garlands of twigs, shoots, foliage, leaves, berries, feathers, lemons, fruits, and wheatgrass etc. Other cheap yet creative options for gazebo wedding decorations include ribbons, dried flowers, creepers, balloons, and several other innovative ideas. Make sure that these drapes created using any of the above options are attached using clasps to keep the gazebos intact and devoid of dents. You can use a uniform decorative approach across the gazebos, arches, and porches etc. For those who wish to use lighting as a means of gazebo wedding decorations , you might want to keep in mind that lighting is generally not considered as a part of gazebo decorations. However, you might still want to consider lighting options, if you are conducting your wedding post late afternoon times. Lighting becomes all the more important in post late afternoon or evening weddings, because time tends to quickly fly by quickly, to give way to darkness, and this is when the lighting can help with visibility. Additionally, decorative lights will also help the cameramen with effective capturing of good quality videos and pictures during evening weddings. Affordable lighting options include candles, or strobe lights focusing on the wedding couple and other lights turned off. Other options include UV black lights or halogen lamps, covered with colorful gelatin papers. Yet other economical lighting alternatives could be moving mirrors, LED lights, colorful lanterns and lamps, candelabras, chandeliers, luminaries or garlands and drapes of small and dim electric lights etc. You can also opt for cost-effective wedding themes. For example a jungle themed wedding can make use of cheaply available raw-materials such as leaves, mud, hay, and wood etc., put together for a creative arrangement. Beach themed wedding parties can make use of sand, coir hammocks, and pillars draped with palm trunk textured wallpapers, to get the beach effect. Gothic weddings can use tents, dried vines, and rusted metal to create a haunted castle atmosphere etc. With all these gazebo wedding decorations in place, you will be all set for a perfect and cost-effective wedding.